Signs of spring are in the air, and the DC Metro housing market continues to pick up steam. Sales and median prices are up from this time last year, and days-on-market is at its lowest level in over seven years. The low inventory of homes for sale continues to play a major role in the market. Active listings have dropped by nearly 20,000 since their fall 2007 peak, and the proportion of townhome listings is now the lowest on record. Interestingly the trend of rising sales and declining new contracts has continued in the region. Sales and new contract growth have resumed in the Baltimore Metro Region housing market after a slow start to the year. The growth however remains much slower than the previous year, possibly highlighting lingering uncertainty in the market. Condos continue to lead in sales, new contracts, and median price growth for the second straight month, while market indicators for single-family detached homes remain sluggish. The inventory of homes for sale in the Baltimore region is at an eight-year low, and new listings continue to fall after six months of stability, further evidence of uncertainty for many would-be sellers. Despite the relatively slow sales growth, the low supply of inventory continues to put upward pressure on prices around the region. All jurisdictions in the Baltimore Metro region posted median sales price growth, with the strongest growth occurring in Baltimore City and Harford County. When Did the Home Price Recovery Begin? 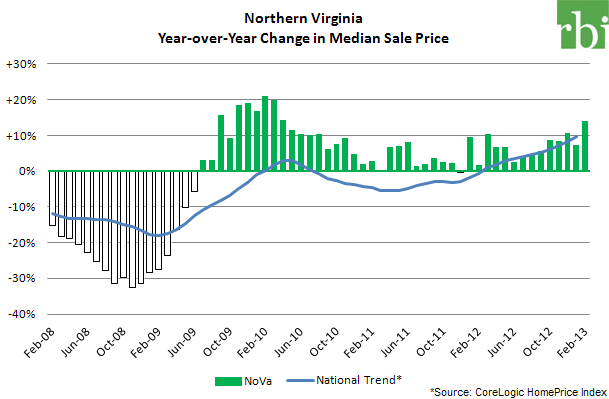 Aside from a slight blip in spring 2010 due to the first-time homebuyer tax credit program, national prices began recovering in earnest in March 2012, whereas NoVa pricing has seen consistent year-over-year gains since July 2009. Pssst...Refer a Friend and Win! Editor's Note: Updated on 3/15. We've sweetened the deal! Referrals are now worth 25% savings and both referrer and referred will be entered in iPad mini drawing! Digging rbiEXPERT and your competitive edge over agents still making guesstimates about local trends? We understand. But this month we're offering a huge incentive for you to spread the word (at least to those colleagues you might owe a solid!). If someone you've referred signs up for rbiEXPERT Annual (by the end of the month), you'll earn 25% off your rbiEXPERT Annual subscription fee. Get two people to sign up, earn 50% savings. Max out with four referrals signing up and you'll have earned 100% of your subscription free back! 100% savings on rbiEXPERT should be incentive enough. Price growth continues throughout the Washington DC Metro Region, driven by the low inventory of homes for sale. The low inventory is also pushing up the average sale-to-list price ratio, which is now at its highest level since the summer of 2006. While active listings remain at historic lows, new listings are beginning to show signs of what could be a changing pattern. New listings are up over 13 percent across all property segments in the region compared to last month, which is well above the 10-year average change for each segment.